Brexit will help blow a £5 million black hole in the pension pot of North Wales Police over the next two years – and could mean 133 fewer officers or a massive increase in council tax. 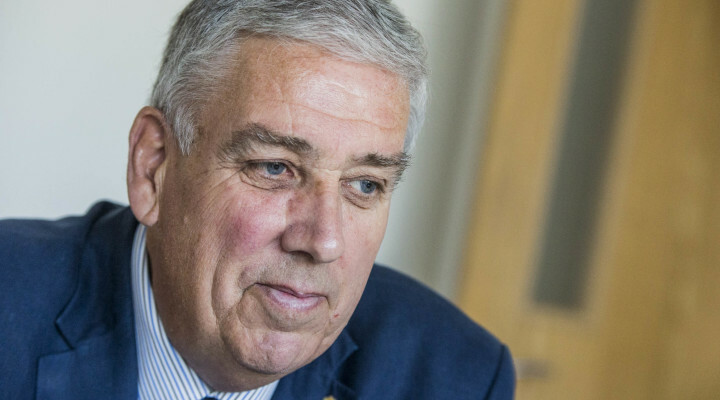 North Wales Police and Crime Commissioner Arfon Jones warned there was even worse to come because of proposed changes to the police pension scheme which would see a 10 per cent hike in employer contributions. The £1.9 million shortfall next year would rise to nearly £5.3 million a year in subsequent years, putting an even greater strain on the thin blue line. As it stands, retired officers are paid their pensions through the contributions of currently serving officers, employers’ contributions from the force and then topped up by a grant from the Home Office. However, the Home Office is proposing to increase the employer contributions by forces – without increasing the funding to match it. One of the main reasons for the pensions bombshell, said Mr Jones, was the uncertainty caused by Brexit and whether or not a deal could be struck. The proposed changes are based on the pre-Brexit economic forecasts of the Office of Budget Responsibility and reflect the uncertainty prior to the Brexit vote which continues to blight the forecasts. Across the UK the police pensions cost is set to increase by £165 million in 2019/20, before rising to £417 million, which could mean 4,000 fewer officers next year and ultimately 10,000 fewer from 2020/21. According to Mr Jones, the proposals flew in the face of an official review of police pensions by John Hutton, the chair of the independent Public Service Pensions Commission, which had sought to ensure employer contributions to public sector pensions were affordable. As a result, the stark choice is to massively increase police precept by £16.92 or to drastically reduce the number officers policing North Wales. The commissioner has now written to all North Wales MPs and AMs to flag up his concerns about the “unaffordable and unnecessary cost pressures for policing in North Wales”. He has invited the elected representatives to a briefing by him and the new chief constable, Carl Foulkes, in January. In the meantime, he is calling on the Government to reconsider the potentially disastrous pension changes. Mr Jones said: “The current proposals are for a 9.7 per cent increase in the employers’ contribution rate, potentially increasing that rate from 24.2 per cent to 33.9 per cent . “Police and Crime Commissioners cannot, by law, set an unbalanced budget. This means that this money must be found from increasing council tax, drawing from reserves, or by reducing expenditure. “In North Wales, we estimate that the cost in 2019/20 will be £1.982 million, and £5.286 million in each subsequent year. “Reserves are a one-off resource, and while they may be used to help in the short term, to rely on these is unsustainable. Therefore, the money must come from a combination of cuts and council tax. “We’ve already suffered years of cutbacks because of austerity and the budget for 2018/19 is £31 million lower than it would have been had funding kept pace with inflation. “This means that in the last eight years, £162 million less has been spent on policing North Wales than would otherwise have been the case. “Whilst we continue to strive to deliver further efficiencies, unexpected and unnecessary cost pressures such as this put a major strain on our limited budgets. “Reducing the budget a further £1.982 million would be approximately equivalent to 50 police officers while £5.286 million is approximately 133 officers. “To reduce the workforce by such a high number would inevitably impact on workload and morale, but would also impact upon the safety of our communities across North Wales.